Jason McCullough: I'll expect all the law abiding citizens of this community to back me up on this job. Olly Perkins: Oh, they will Sheriff. Well, maybe not all of 'em. There's trouble brewing in Calendar, Colorado, ever since the mayor's daughter, Prudy Perkins (Joan Hackett), discovered gold during the ceremony for a stranger recently arrived...and departed. With a sudden increase in its population and no law and order, the town is in chaos, with fights and shootings erupting daily. Mayor Olly Perkins (Henry Morgan) and his council need a lawman to whip the town into shape, but no one has been up to the challenge, either retiring six feet under or skedaddling out of sight when trouble arises. Enter Jason McCullough (James Garner), taking a slight detour on his way to Australia, who arrives to do a bit of prospecting. After witnessing one of the local hooligans, Joe Danby (Bruce Dern), shoot a man down in cold blood in the saloon, then experiencing the sky-rocketing cost of living in Calendar, he decides to apply for the position of sheriff, which seems better paying than prospecting. With the mayor desperate for someone to take the role, McCullough gets the job, and right after getting set up at the mayor's house, decides his first order of business is arresting Joe Danby for murder. The problem is that the Danby family controls the only route to cash in people's gold, and thereby runs the town. Jason carries out his plan anyhow, but gets some assistance in the form of Jake (Jack Elam), a man who up until that day spent his time shovelling horse, um, working at the stables. The arrest successful, the next hitch is that although the town has a jail, it just doesn't have any bars to keep the prisoners in. A bit of ingenuity remedies that, and with Jake as his new deputy, the town begins to quiet down. Well, except that Miss Prudy has taken a shining to the new sheriff, and it's only a matter of time until the Danby family makes its way to free their kin. Things will get a might ugly, but with some support from the citizens order will be maintained. I mean, it will, won't it? Support Your Local Sheriff is a great western parody, playing up on a lot of clichés from the genre, and adding its own comical twists. Garner plays the role straight, with Jack Elam turning in an excellent performance as his unwilling deputy. The cast also includes a number of other western regulars, Harry Morgan (M*A*S*H's Colonel Potter), Walter Brennan (as Pa Danby), and Henry Jones to name a few, and each lends great supporting characters to the film. Joan Hackett plays off Garner beautifully, as the daughter who, while to trying to make herself appealing, always finds herself in compromising situations around her lead actor. Bruce Dern also portrays the not too bright Danby son to good effect. Director Burt Kennedy (The War Wagon, Hannie Caulder) keeps the pace moving and delivers the comedic elements in an understated fashion, adding to their humor. His 1971 followup, Support Your Local Gunfighter has been released in concert with this film. Support Your Local Sheriff makes a welcome addition to any western collection, and the more familiar you are with the genre, the funnier it gets. Image Transfer Review: Presented in a 1.85:1 anamorphic transfer, the image quality varies thoughout the presentation. Sequences, especially the opening, display muted colors and excessive grain. There is also some degree of print anomalies present, as well in the form of dust and scratches. For the most part things look quite passable, though never outstanding. The look is a little soft, though closeups tend to fare better. Colors never seem over saturated, though hold up better in some areas more than others. Audio Transfer Review: Audio is presented in two-channel mono, and though free of distortion and featuring a suitable frequency range, the dialogue mix leaves a lot to be desired. Levels fluctuate noticably, making some lines harder to hear than they should be, which is somewhat distracting. This may have been in the source, though it sound like a processing issue to my ears. Still, it is servicable, and doesn't detract from the feature too badly. A French track is also included. Extras Review: Like the packaging, which features only a single sheet pullout replicating the cover art (note, not the film's original artwork), the disc is light on supplements, with only a 3-minute, nonanamorphic, full frame trailer present. Do allow yourself some extra time to wade through the extensive security stickers entombing the disc. 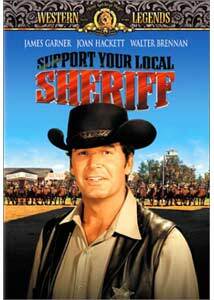 I've always liked James Garner, so his role in Support Your Local Sheriff was fun to watch. The superb supporting cast and fun script makes for an enjoyable spoof of the western genre. Not exactly reference quality in its presentation, but this is still the best available. Recommended.